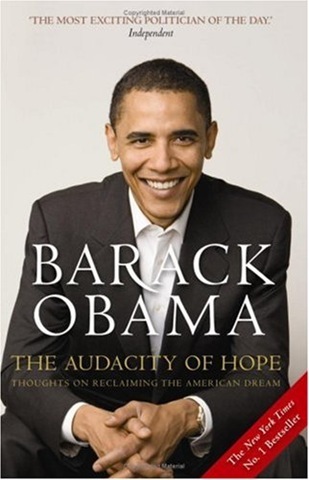 On my way home at Sydney airport over the weekend, I stopped by a bookstore in the airport terminal waiting for my plane back to Melbourne and came across Barack Obama’s new book “The Audacity of Hope: Thoughts on Reclaiming the American Dream” and I must say, so far its an amazing book. It’s been almost ten years since I first ran for political office. I was thirty-five at the time, four years out of law school, recently married, and generally impatient with life. A seat in the Illinois legislature had opened up, and several friends suggested that I run, thinking that my work as a civil rights lawyer, and contacts from my days as a community organizer, would make me a viable candidate. After discussing it with my wife, I entered the race and proceeded to do what every first-time candidate does: I talked to anyone who would listen. You know when you find a book you just can’t put down you’ve stumbled across something really amazing. He writes in a very clear manor which is very pleasing to read. He is a remarkable story teller and grabs you right from the start to the very end. I’m about 2 chapters in so far out of a total of nine, in which he covers many aspects of his political views, his thoughts on current politics both in America and the world and how since becoming president how he and his party can change things for the better. “The Audacity of Hope” has a very personal feel and you know you’re reading something quite special when the leader of the free world is making fun of himself (in a simply humorous way). It adds understanding and value to his words, something that we can all relate to. “Barack Obama writes with intimacy and self-deprecating humour about balancing his family life and his public vocation. His search for consensus and his respect for the democratic process inform every sentence he writes”. If you’re interested in politics or just interested in Barack himself I’d strongly suggest you pick this one up, its truly an amazing piece of work. Barack Obama Loves His Mac…And Quite Possibly Pacman! I might have to give the book a shot. I agree with Aubree… Im not a huge reader – but you’ve definitely sold it well. I’ll let you know when i’ve had a chance to pick up a copy.